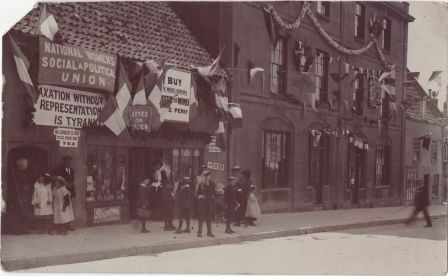 This photograph shows the National Women’s Social and Political Union shop in Glastonbury. It carries several banners ‘Taxation without representation is tyranny’, ‘Votes for women’ and an advert for the ‘weekly newspaper Votes for Women’ available for one penny. According to Spartacus Educational, the newspaper was established in 1907 and was published monthly until April 1908 when it went weekly and from May 1908 it was reduced in price from 3 pennies to one penny. 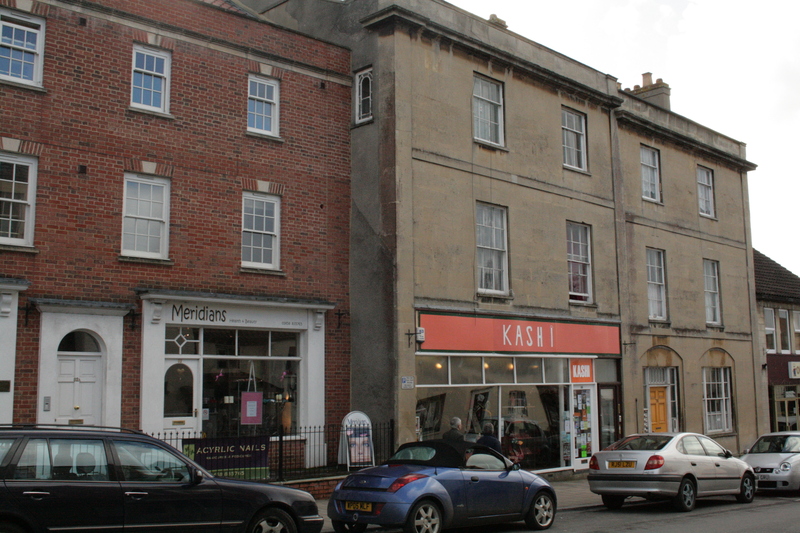 The shop is now gone but the photograph below shows how Glastonbury High Street (number 82) looked when this photograph was taken a couple of years ago. The NWSPU shop is where ‘Meridens’ is now situated. Clues that match the location are the windows of the upper two floors of the solid stone building next door – the window treatment, the door opening of the further (yellow) door and particularly the stringcourse, the stone line that defines the first and second floors—it’s stepped down a few inches in the centre of the building. An echo of the original building can also be seen on the side of stone building showing a mark where the roofline of the lower building abutted it. 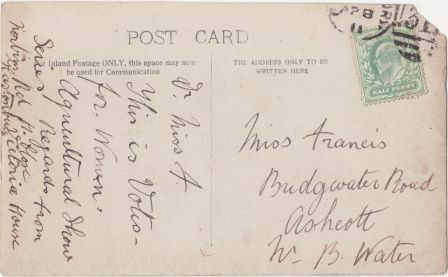 There is a paper entitled ‘Commercial places, public spaces: suffragette shops and the public sphere‘ by John Mercer available online and a blog that also discusses the role of the WSPU shops in women’s lives. Hi! I live in the “solid stone building” next door at number 80 for a few years now and I adore the building. I’ve always wanted to know how it would have looked before the conversion into flats and a shop so this is amazing to see, thank you! I was wondering who owns the original image, as I would happily pay for a copy! I’ve lived in the “solid stone building” next door at number 80 for a few years now and I adore the building. I’ve always wanted to know how it would have looked before the conversion into flats and a shop so this is amazing to see, thank you! I was wondering who owns the original image, as I would happily pay for a copy.